In Latium Region it is possible to distinguish two main macro-areas of Francigena Routes separated by Rome, being exactly in the middle of the region. 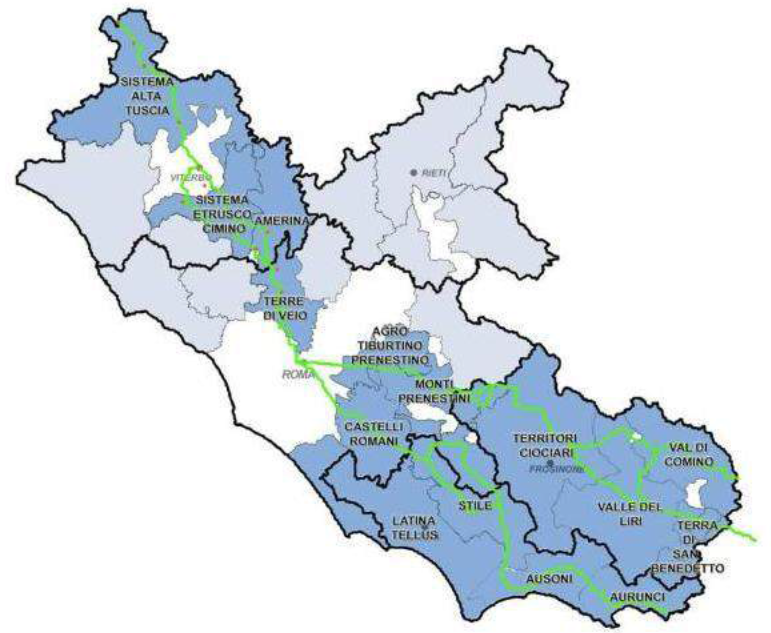 However, the present work will mainly focus on the Southern area, given the fact that the case study as well as the enterprise incubation within Cultour plus are situated in Southern Francigena beam of routes. Overall speaking, Francigena Route, from North to South still requires the Region to further enhance the unity of it, pushing for a greater number of facilities and road accessibility/security infrastructures, guaranteeing a common code to host pilgrims and walkers. Figure 1. The two macro-areas of Francigena Routes. Source: BIC Lazio. The northern part of the Francigena route in Latium has been traditionally characterised for a more structured frame, aligning itself to the more general standards present in the rest of the European traits. When it comes to the hosting standards, it is possible to observe that ‘poor’ hosting structures are concentrated in the northern part of Latium Region, whist the more one becomes closer to Rome, and the fewer ‘poor’ structured one can meet. This means that any lodgement costs at least 20€ per night. Differently, when one reaches Rome, hosting becomes focused on low-costly offers for the pilgrims, thanks to the work of volunteers of different associations. In fact, symbols guiding pilgrims are aligned to the rest of Francigena Route. What is more, the security of the pilgrims has been of the main strong points, with exception of a few traits, which are under the process of restoration. The Southern part, starting from Rome in the direction of Jerusalem, has been traditionally less structured and defined in its route, given the fact that pilgrims decided to choose different patterns, according to the local situation or the temporary situation of the Southern Francigena stream. Indeed, in Francigena Route can be distinguished two main directions recognised by Latium regional authority. The mentioned traits have the official status as the whole technical procedure referred to planning, project management and feasibility studied has finished. What is more, the Integrated Planning Areas of Southern Latium have put the basis for the cooperation of mountain communities, communities and counties. The first direction lies between Prenestina and Latina roads, crossing the entire Rome and Frosinone counties. Such a beam of roads crosses 43 town-halls and it is split into two main variations, one towards Cassino and the other one through Comino valley. Montecassino and Casamari are the main abbeys, which are present in this area of Southern Francigena Route. Such a pattern is also characterised by the possibility of downloading an app which can guide pilgrims in the last 90 kms of Route towards Rome. The second direction is along Appia Road, from Rome towards Terracina, crossing Latina, and reaching Campania Region. It involves 29 municipalities, mainly sited on the mountains. Fossanova and Valvisciolo are the main abbeys along the route. Both roads, counting 270 kms of path, can be crossed by walkers, pilgrims and tourists. Latium Region, together with the Ministry of Agriculture Policies, has recently financed the specific road signs along the way. What is more, Southern Francigena Route is slowly taking its shape through a constant and systematic tourism and cultural promotion. However, it seems to be still fragmented, particularly for the hosting structures which still lack the culture of pilgrimage. Hotels, B&Bs, hostels represent still a niche reality for the chronic lack of mainstream tourism, with the exception of a few heritage sites along the Route. The detection of the Francigena Route has been designed by Latium taking into consideration the historical habits of pilgrims, combining also the enjoyment of the regional landscape. Figure 2. 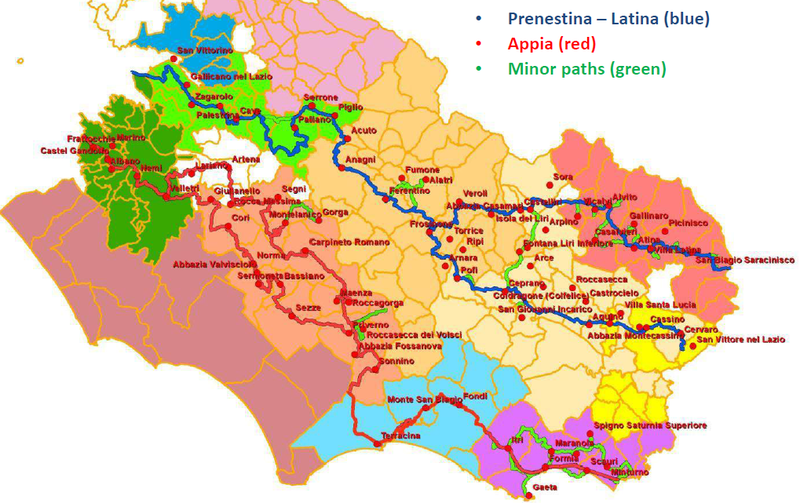 Southern Francigena beam of routes in detail. Source: BIC Lazio. Checking among different websites and different online tourism portal, it is apparent that southern Latium has a lively universe of associations and events related to the Southern Francigena Route. They are aimed at raising awareness on a different set of elements and cultural items, as well as on the most traditional values of the territory which is profoundly connected to Middle Age and Renaissance show revivals. However, it is also evident that there is a quite huge fragmentation of actors along the Southern Francigena Route, often related to religious-like organisations or to wider organisations also present in other regions. The lack of homogeneity determines still weak strategies, but this is more referred to a too-recent policy development, above all in the southern Latium Region. Some already existing organisations (such as town-hall groups, public consortia etc.) have slowly enlarged their area of competences focusing on the overall hosting management. Each organisation is much focused on the activities to do, but there is an almost-non-existing network which can guarantee pilgrims’ hosting. This is one of the major weaknesses of the overall situation along Francigena Route in Southern Latium when it comes to hospitability and local-relation development. The scope of the organisations is still micro-focused and it still fails to create connections with the importance and the networks present of Rome. There are also some news websites which are more or less regularly updated. At the opposite, they face a high rate of cancellation from the internet. This is probably due to projects which work well as long as they are funded, but they may lack a long-term perspective behind this. Indeed, it is possible to say that this is the picture of an on-going situation where the regional government and municipality groups will play a major role in rationalising and providing the momentum for wider hosting/tourism strategies about the pilgrim routes of the region. This entry was posted in Case study and tagged Camino de Santiago, Case Study, Cultural heritage, Cultural Management, Cultural Routes, Cultural Tourism, Entrepreneurship, Erasmus+, Erasmus+ Key Action, Social Anthropology, Strategic Partnerships. Bookmark the permalink.